In this article, we’ve gone on a hunt for the best shampoo for Golden Retriever dogs, to help you identify the best tried, tested and beloved products amongst the ones that just don’t wash.
As a Golden Retriever owner, you know this breed is magnificent! This glorious golden coat is thick, shaggy, sometimes even wavy like your dog has been to a dry bar for a blowout! What often goes unmentioned in all this is that underneath that coat, your Golden’s sensitive skin is relying on all that thick, insulating double layer fur to keep it safe. In other words, how you care for and groom your Golden’s coat will also have a direct impact on your dog’s skin and fur health! In this article, we take a comprehensive look at the best shampoo for Golden Retriever coat and skin health. What is the best dog shampoo for Golden Retrievers? Should you use a special Golden Retriever puppy shampoo? What about choosing the best shampoo and conditioner for Golden Retriever bathing and coat care? Read on to learn about some of the best Golden Retriever shampoo and conditioner options to keep your precious pup feeling great and looking glorious! The ongoing Golden Retriever Lifetime Study has 3,000 canine and human participant pairs. The study aims to build a comprehensive health profile for this super popular dog breed, highlighting how genetics, nutrition, lifestyle and environment impact the golden’s health and lifespan. One early discovery in 2016 sheds light on the wide variety of skin issues Golden Retrievers can experience. Outer ear infections (otitis externa) is the most common condition, followed by hot spots (acute moist dermatitis). Third on the list is atopy – environment-based allergies, then contact dermatitis, flea allergies and food allergies. Finally, demodectic mange, caused by the Demodex canis mite, affects Goldens with compromised immune systems. Clearly, your Golden Retriever can develop quite a few really uncomfortable and life-limiting skin conditions! When your dog suffers, you suffer, and choosing the wrong Golden Retriever shampoo can just make things that much worse. What all this tells us is simply this: the skin and coat care products you use for your Golden’s care can really improve your dog’s health and comfort! These are some of the brands specially created with Golden Retriever coat’s in mind. Remember, if you’re looking for a shampoo to treat a specific skin condition, consult your vet about which products are most suitable before you part with your cash! This long-lasting formula means a little goes a long way when you are shampooing your Golden. Calendula extract and rosemary leaf juice add extra shine and body to your dog’s coat. There is a matching conditioner you may also want to add to your dog’s bathing routine. Healthy Breeds make a range of breed-specific dog shampoos to help keep your dog’s coat smelling fresh and ensure her skin is pH balanced and itch-free. The hypo-allergenic ingredients won’t interfere with topical flea and tick medications. The maker also offers other sensitive skin shampoos with aloe and chamomile and a whitening shampoo for light-coat goldens. Golden Retrievers do tend to suffer from dry skin more than other dog breeds. Your veterinarian may recommend a oatmeal-based shampoos and conditioners as among the best for Golden Retriever dogs to help soothe and moisturize skin naturally. Oatmeal can be particularly soothing after your pup has gone swimming! Oatmeal shampoo is not only a great way to gently release allergens, toxins or chemicals from river, ocean or pool swimming, but it naturally restores your dog’s pH balance. This hugely popular, lovely all-natural dog shampoo contains oatmeal to soothe dry, itchy skin (pruritis) and aloe vera to ease skin irritation. This shampoo is pH balanced and soap-free – even if your pooch accidentally swallows some, it will not cause harm. If you use topical flea and tick medicine, this shampoo will not wash it out. And you will love the light vanilla fragrance for your dog’s freshly washed coat! If you want to add conditioner to your dog’s bath time routine, try this Earthbath Aloe & Oatmeal Conditioner. This gentle all-in-one shampoo and conditioner includes oatmeal, shea butter, aloe vera and dead sea minerals to soothe dry, itchy skin and rebalance your pup’s skin pH. It is safe to be used on your dog’s face and around eyes. In unanimously positive feedback, dog owner especially say they love the fragrance. This soap-free, all natural and gentle oatmeal shampoo and conditioner and won’t impact topical flea and tick medications. The formula is designed to work four ways: clean, condition, detangle and deodorize. It can also help with static electricity! It sure can be hard to watch your Golden Retriever itching and scratching and scratching and itching! You know your dog is suffering and just want to offer some quick, effective relief! It is always wise to talk with your veterinarian before making any big changes to your dog’s routine. If there is a more serious underlying health issue that is causing the skin irritation, your vet may want to suggest a specific shampoo to address that. These products might also fit the bill to provide fast relief – your vet can help you decide which one to use if you are unsure! This 5 in 1 cleaner, conditioner, detangler, deodoriser, moisturiser, and sensitive shampoo for dogs does it all! Because of their super-thick coats, Goldens tend to struggle a bit more with tangles and mats than other dog breeds, which makes this a go-to shampoo. When your Golden is twelve weeks (3 months) old, you may want to begin using this gentle and nourishing pro-grade shampoo, conditioner, detangler, deodoriser and moisturizer blend. The fragrance is very light and pleasant, according to owners. Tea tree oil, lavender oil, neem oil and soothing oatmeal are key ingredients in this soothing anti-itch shampoo. This line also includes a hot spot relief shampoo, a sensitive skin shampoo and an oatmeal medicated shampoo for special health issues. This unique medicated dog shampoo is anti-bacterial, anti- fungal, anti-yeast and anti-itch. The formula is designed to heal hot spots and abrasions. It uses pomegranate and dead sea minerals to nourish and replenish dry, damaged and itchy skin. Owner-reviewers are very happy with the results. If you are caring for a Golden Retriever puppy for the first time, you may not yet realize how enthusiastically Golden Retrievers can shed. Some owners even joke that they buy their car or their wardrobe to match the color of their Golden’s fur! With regular brushing, grooming and bathing, you can keep your Golden Retriever’s skin and hair healthy. Frequent grooming will also reduce the amount of shed hair you have to sweep, vacuum or brush off your floors, car seats, couch cushions and clothing. These shampoo Golden Retriever products specifically target seasonal as well as year-round shedding to help you enjoy your pooch without living under a pile of shed dog hair! Whether or not you use the rest of the FURminator product line, this de-shedding dog shampoo may end up being on your must-have list when your Golden begins to shed yet again. The formula contains lots of natural nourishing ingredients such as essential fatty acids, chamomile, papaya leaf, aloe vera and Vitamin E that help to soothe and moisturize skin while encouraging loose hair to fall out. You may also want to use the FURminator deShedding conditioner. This highly rated and popular shed control dog shampoo includes lemongrass and sage extracts, coconut oil and fatty acids and aloe vera to help lengthen the life of each hair and lessen shedding. The Wahl company also offers other formulas for different bathing needs including flea/tick control, whitening, odor control and puppy formula shampoos. This oat protein and organic aloe vera-based simple shed control shampoo works to strengthen each hair shaft to reduce shedding year-round. You can use just the shampoo or the whole bathing system regimen. Groomers also use this shampoo in their grooming work have left positive reviews, and owners say the smell is wonderful. 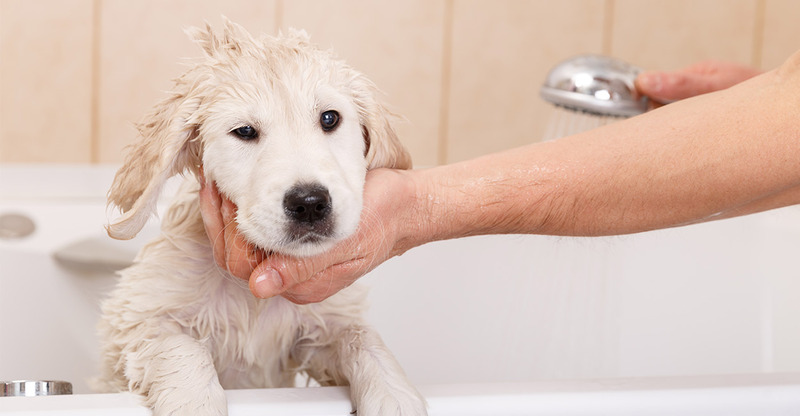 First-time Golden Retriever puppy owners often wonder when to start bathing their puppy and how often to bathe them. These are normal and very smart questions! Another common question is what is the best shampoo for Golden Retriever puppy coat and skin care? 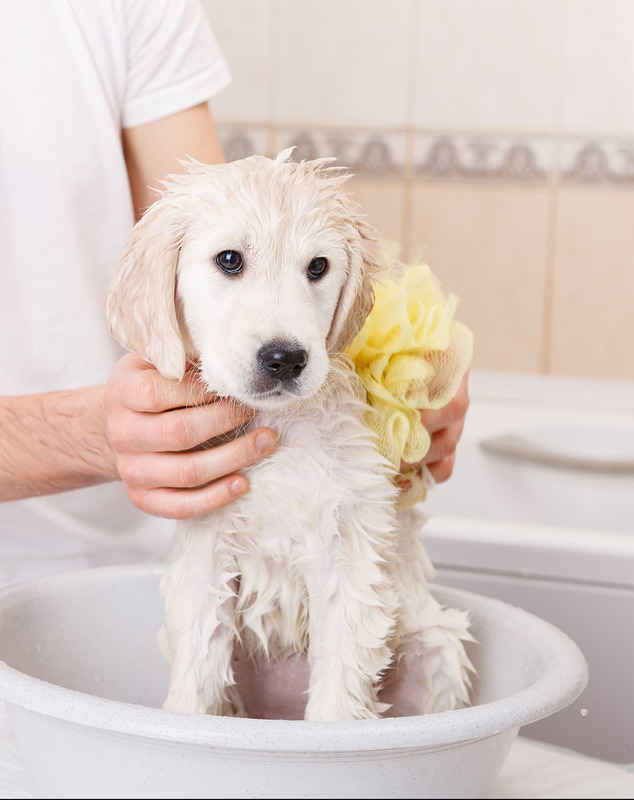 Puppies do not typically need to be bathed as frequently as adult dogs – once a week will generally suffice unless there is a pressing need for a bath (such as rolling in something very stinky!). Also, puppy skin is more sensitive than adult dog skin, so the gentlest possible dog-specific shampoo (NOT people shampoo!) should be used during the first year of life. These best puppy shampoo for Golden Retriever options earn high marks with owners and puppies. NOTE: For a more complete look at puppy bathing, take a look at our complete guide to puppy bathtimes. This simple, affordable puppy shampoo is enriched with keratin protein and jojoba oil in a tearless, milk protein-based formula. It is concentrated so you get a lot of washes out of one bottle of shampoo. The scent is baby powder – perfect for your sweet fur baby! Some owners like it so much they use it on their adult dogs as well. This hypoallergenic tearless puppy shampoo is enriched with safflower oil and shea butter to nourish your puppy’s delicate skin and coat. The formula is pH balanced for the healthiest puppy skin. It is scented with a light orange fragrance. If you have ever wished your puppy could smell like jasmine, now is your chance with this pH balanced, tear-free, gentle puppy shampoo. It is safe to use with topical flea and tick medications and gentle enough for weekly use. Silk, soy and milk proteins nourish and moisturize skin and coat, and aloe vera, honey and chamomile eases any skin irritation that may be present. This is a product also used by professional groomers. After reading through this list of Golden Retriever shampoos and conditioners for puppies and adult dogs, you now know you have plenty of great options you can use! Of course, now the challenge is to pick one to try! There are so many ways to pick a dog shampoo – you might look for specific ingredients (like oatmeal), a specific scent you prefer, a shampoo and conditioner combo or a medicated shampoo for a particular skin issue. Remember, always consult your vet before purchasing a shampoo to target a specific skin problem. And finally, it is always smart to buy the smallest bottle available until you know if it will work well for your dog’s bath time needs. What Golden Retriever shampoo and conditioner do you currently use? Do you have a favorite product that leaves your Golden Retriever’s coat soft and smooth and sweet smelling? If you have found an awesome product we didn’t mention here, we’d love to hear about it over in the forum. Morris Health Foundation, “Data from Golden Retrievers sheds light on occurrence of skin problems in dogs,” Golden Retriever Lifetime Study, 2016. Wynn, S.G., DVM, “Alternative therapies for pruritic skin disorders,” Topics in Companion Animal Medicine, 2002. Carlotti, D.N., Dip ECVD, “The Art of Shampoos in Veterinary Dermatology: Treatment and Prevention Strategies,” 2003. Kirkpatrick, P., DVM, “Scratch That Itch in Spring,” Bayswater Veterinary Clinic, 2018. Jones, C., BSc, BVMS, “Caring for Your Puppy: Bathing,” Essendon Veterinary Clinic, 2018.